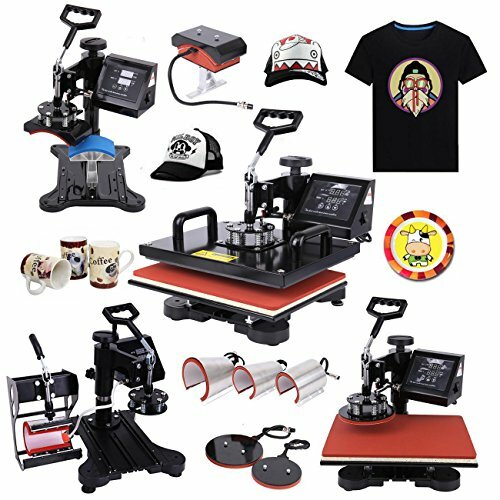 Ridgeyard 1000W Digital LCD Display Multi-functional Transfer Sublimation T-Shirt Mug Hat Plate Cap Heat Press Machine (8 in 1 machine) by Ridgeyard at Vains Faktory. MPN: R-X8YF-US. Hurry! Limited time offer. Offer valid only while supplies last. Feature: CE certification Built-in fuse for safe using Adjustable feet for unevenly floor Digital LED controller * Timer: set the desired time. * Timer: set the desired time. * Temperature: set the desired temperature. * Warm up quickly and offer even heating. * Helps to ensure even pressure. * Heat-resistant pad keeps shape under 400 ℃. Made of heavy-duty and commercial-grade rigid steel frame, super stable and built to last. Full 360-degree rotation of swing-away design helps you avoid to get a burn when take off your garments. Adjustable multi-spring balancer allows pressure to be more evenly distributed across the entire platen when it is closed.